This eye-opening video from the Akita Rescue Mid-Atlantic Coast is so helpful. As a community, we are very lucky that they were able to catch such a clear example of GDV/Bloat in progress! As you'll see, and as they highlight in the voiceover, the poor dog in the video is exhibiting many of the dog bloat symptoms outlined below. Unsuccessful vomiting, or the dog can only bring up foamy saliva. If you see this, IMMEDIATELY bring them to the vet! Restlessness, inability to lie down, panicked or distressed, pawing at or looking at their belly, rapid shallow breathing, and pale mucus membranes. Bring in your dog for immediate veterinary attention. If your regular vet isn't open, please seek immediate attention at another vet or find a local Animal ER. Do not attempt to give your dog any over-the-counter medications or “folk remedies.” This could make matters worse and delay critical treatment. If possible, call to inform the vet that you are on the way. This will give them time to prepare for your dog’s arrival. In the most general sense, dog “bloat” refers to an enlargement or swelling of the abdomen. If your dog’s stomach is bloated, it could be due to a number of underlying causes, ranging from mild to severe, with GDV being on the severe side. Given the consequences of failing to treat GDV, a dog that looks bloated should always be brought to the vet as soon as possible. When pet owners talk about bloat, they’re usually referring to the extremely serious conditions of torsion or GDV. Torsion refers to a twisting of the stomach. A dog’s stomach can become twisted at either end. In a case of stomach torsion only, the stomach twists, but doesn’t completely block the flow of gas, liquid, or other stomach contents out of the stomach. If the twist ("torsion") occurs at both ends and completely blocks the escape of gas, liquid, and other stomach contents, this is now called a "volvulus" and it will cause the stomach to expand like a balloon ("dilatation"), hence the bloated stomach. This is Gastric Dilatation and Volvulus, or GDV. In a case of GDV, it's not just the passage of gas and liquid from the stomach that's compromised, it's also the blood flow to and from the stomach, as well as throughout the rest of the body (including to and from the heart), that's severely compromised. The severely bloated stomach can also cause breathing issues and a host of serious metabolic problems — such as acid-base and electrolyte imbalances, and widespread inflammation — for the dog, which lead to some of the symptoms described below and can be fatal. Bloat/GDV will not resolve itself. If a dog with GDV is not brought for veterinary care and surgery, the dog will not survive. It is important to note that not all dogs with GDV/Bloat will exhibit all of the following signs and symptoms. Even some of the most common symptoms of bloat aren’t always easy to see. Hard, distended or bloated abdomen: This may not be obvious if your dog is very large or deep chested. 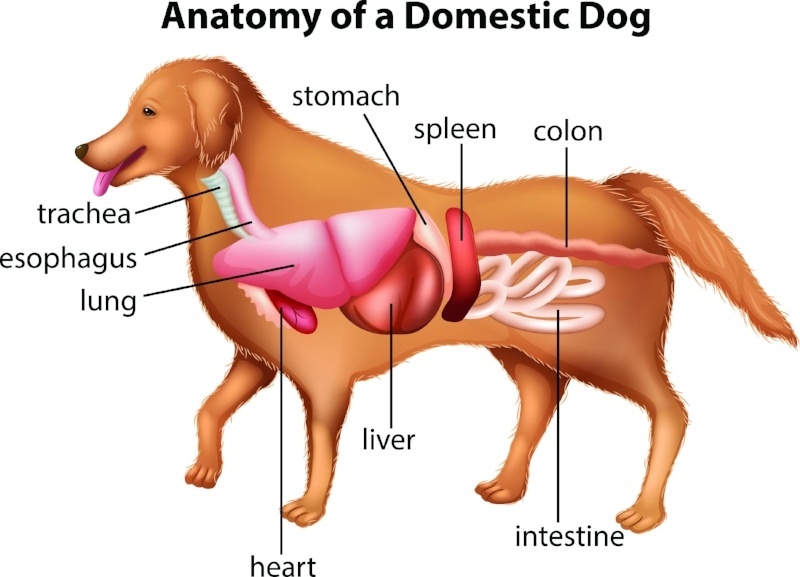 In these dogs, the area of the abdomen where a distended stomach resides may be up behind the ribcage. This may be even less obvious if your dog is especially furry or overweight. Therefore, the absence of visible bloat does NOT rule out the condition! To see an example of a bloated dog, check the video above. Unproductive retching: A dog suffering from GDV/Bloat may try to vomit without anything (or very little) coming out. You may see small amounts of water or, more often, large volumes of thick, stringy saliva. This is still considered "unproductive retching" and unproductive retching is almost always an urgent sign of GDV/Bloat in dogs. Pacing and restlessness: Dogs affected by GDV/Bloat will have a difficult time getting comfortable and lying down. This is because they are in true physiologic (physical, mental, and metabolic) distress and, sadly, are in the process of dying. Pacing and restlessness is often one of the most obvious and early signs, so pay attention to it! In the later stages, your dog's pacing and restlessness will deteriorate to staggering, collapse, and decreased responsiveness. Excessive saliva: The amount of saliva in dogs suffering from GDV/Bloat is sometimes quite profuse. This excess saliva may be accompanied by "lip smacking." Both signs are partially the result of the nausea that affected dogs experience with this condition. Standing with elbows pointed outward and neck extended: This is your dog's attempt to improve their ability to breathe. This is necessary as the rapidly distending stomach makes it difficult for the lungs to expand. Your dog may instinctively move their elbows away from their chest and point the elbows outward to help (albeit minimally) enlarge the space available for the lungs to expand within the chest cavity. Fast, heavy, or otherwise difficult breathing: This isn't just a result of the decreased space in the chest that's available for the lungs to expand; it's also because of the acid/base and other metabolic abnormalities that are occurring in your dog's body as a result of GDV/Bloat. The pain and distress caused by the condition also contributes to these breathing changes. Rapid heart and pulse rate: This can be an early sign due to the pain and distress associated with this condition. However, it's also typical as the condition progresses, due primarily to the compromised blood flow throughout your dog's body, as they are in a true state of shock. In the later stages of shock, the pulse rate will actually drop — this is a very bad sign! For this reason, as well as many others, you should know how to check your dog's pulse rate, and know what your dog’s normal resting pulse rate is. See how to check your dog’s pulse in the video below. Pale mucus membranes and prolonged capillary refill time (CRT): The color of the tissues above your dog's teeth can be an indication of the health and function of their circulatory system (heart and blood vessels). I've emphasized "can" because multiple other, non-circulatory factors (pain, dental disease, and others) can also influence this color. If you notice that these tissues have lost their typical pink color and have become pale, or if it takes more than 2 seconds (or less than 1 second) for that pink color to return after applying gentle pressure with your finger, this may indicate a problem — especially if accompanied by any of the other symptoms in this list. The return to color — whether it’s too slow or too quick — can vary based on how far the condition has progressed. Collapse: This, as you might imagine, is a very obvious sign — so long as someone is around to witness it. Sadly though, collapse is typically a very late sign of GDV. Often, by the time an affected dog collapses, the condition has been going on for quite some time. At this point the prognosis for survival is getting significantly worse by the second. Many conditions in dogs can result in collapse, and collapse is always a sign of a serious problem that warrants immediate evaluation by a veterinarian. If your dog collapses, for any reason, bring them to a veterinarian immediately. You 100% cannot and should not attempt to treat dog bloat at home. There are no home remedies, medications, or supplements that are safe or effective to give a dog that is suffering from GDV/Bloat. The only correct way to treat bloat is to get your dog to the vet as soon as possible! Even if it's not a case of GDV, your vet can identify a mild to moderate stomach issue and give your dog some relief. If your dog is suffering from GDV, no amount of Gas-X or any other at-home treatment will cure or help your dog. In fact, the struggle of trying to get oral medications into your dog when they have a twisted stomach will worsen their discomfort and distress, and also carries the risk that the medication will wind up in their lungs (or that you will be bitten). The time wasted trying to give at-home treatments will unnecessarily delay the proper veterinary evaluation and care needed to give your dog the best chance of survival. Bloat/GDV can kill a dog within an hour if untreated. This is why we vets can’t stress it enough: If you notice that your dog is bloated, it is officially the time to get them to the nearest open veterinary hospital ASAP. If your regular veterinarian’s office is closed, bring your dog immediately to the closest Animal ER. Please, don't trifle with or delay in the face of this condition. GDV is no joke! Still unsure if your dog has GDV? Even if you think there’s a chance that your dog may currently be suffering from GDV, please err on the side of caution and bring them for immediate veterinary evaluation. The cost of an emergency vet visit will pale in comparison to the peace of mind you’ll get by doing so. Can Dogs Survive Bloat / GDV? Dogs suffering from GDV can be saved! While the Akita Rescue video in this article is an important resource, I would like to clarify one of the statements they make at the end of the video. They say that "bloat is 95 percent fatal.” It’s very important to note that this quoted mortality rate (i.e., the percentage of affected dogs that die or are euthanized) is for cases that go undetected and/or where appropriate treatment is declined or unnecessarily delayed. The prognosis for survival is significantly better for cases that are (1) caught earlier and (2) treated appropriately and promptly. Mortality rates for dogs treated appropriately and promptly have been reported as low as 15 percent. If you believe your dog is suffering from Bloat/GDV, I'm truly sorry as this is a distressing time for you and your dog. However, following the steps below will increase the odds of a positive outcome. Call ahead and explain the situation so the hospital staff can prepare for your dog's arrival. Start thinking about finances. Stabilization, diagnostics, surgery, and post-op care for GDV can easily cost in the $2,500–$5,000+ range. If you don't have pet insurance, or that kind of money in your bank account or credit cards, be aware that you may be able to apply for a medical line of credit through a third-party provider, such as Care Credit or Wells Fargo. Be ready to move quickly. Hospital staff will quickly take your dog to the back for initial diagnostics (X-rays, blood pressure, EKG traces, and more). You almost certainly won't be able to go or stay with your dog, but someone will update you as soon as possible, usually after about 15–20 minutes. Know whether you want to resuscitate. If your dog with GDV suffers a cardiac arrest — which is not uncommon — the hospital staff can begin CPR, but they'll need your permission to do so and they'll need it quickly. Fill in the paperwork. Upon check-in, there will be forms and paperwork for you to complete. Use the time that your dog is in the back being stabilized and evaluated to complete these steps, so that your dog can be entered into the system as efficiently as possible. Know that GDV will require surgery to correct, specifically a procedure called a "gastropexy." As with any surgery, complications can arise. Prepare a small, confined space. It's absolutely critical for your dog's healing process their movements and activity be limited following GDV surgery. Prepare a crate or small pen for them at home. Watch for post-surgery complications such as infection, inflammation, lack of appetite, vomiting, and pain. Complications can arise days or even weeks after surgery. If your dog is acting abnormally, or if you're otherwise concerned following GDV surgery, don't hesitate to contact your veterinarian or the hospital where the surgery was performed. We do know that breed, family history, stress (including a fast/nervous eating disposition), and the frequency and amount you feed all play a role in GDV/Bloat. Unfortunately, we don't know all of the factors that can contribute to the development of the condition in all dogs with absolute certainty. There is ongoing research into this subject and, ironically, one factor that was previously thought to decrease risk of GDV/Bloat — feeding from an elevated bowl — actually appears to increase it! If your dog has previously suffered from Bloat, there are steps you an take to help prevent another episode. The gastropexy surgery your dog will undergo should prevent the stomach from ever twisting again. Though it can still distend. Talk to Your Vet: Work with your veterinarian to determine if there is an identifiable (and treatable) condition that contributed to your dog's GDV/Bloat episode. Conditions such as inflammatory bowel disease, food allergies, and other disorders that slow down gut movement may contribute to the development of GDV/Bloat. Small Portions: Feed multiple, small meals throughout the day, rather than one large meal daily. 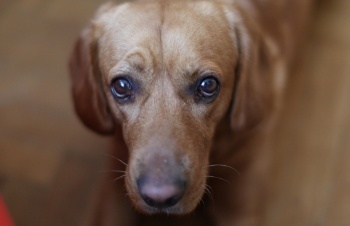 Reduce Stress: Decrease stress for your dog, especially around eating time. If your dog is protective of their food and scarfs it rapidly to prevent your other dogs from getting to it, consider separating your dogs during feedings so everyone can eat more calmly. Slow Down Eating: If your dog scarfs down their food rapidly, even in the absence of any other dogs or other perceived threats around them, slow down their rate of eating by feeding them from an interactive/puzzle feeder. The food puzzles and feeders below are some of our favorites. They are easy to wash, durable, and should slow down your dog's eating significantly. Plus, they present a variety of difficulty levels so you can find a feeder for your dog that won't be too frustrating. To see a slow feeder in action, check out Loki enjoying his. The information you share will help us help many more dogs. It will take 2–5 minutes.